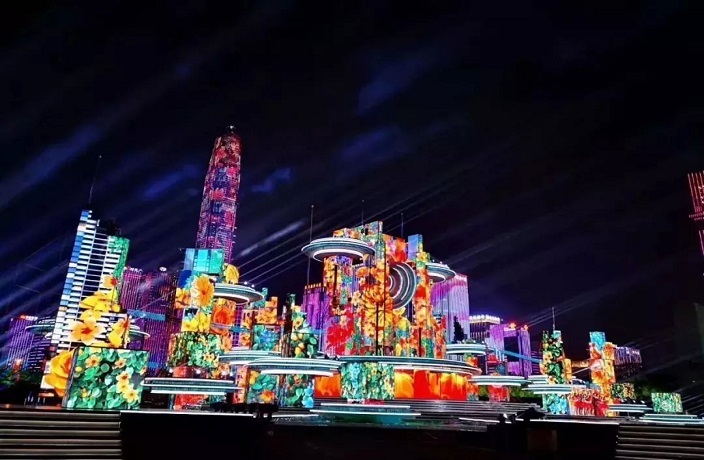 It’s official: the Spring Festival Gala in Shenzhen will be broadcast live in 4K resolution using the latest 5G network, making Shenzhen the first city in China to implement the technology for such purposes. The news was annouced by CCTV earlier last month at a press conference in Shenzhen. If you’ve been to the Shenzhen Civic Center lately, you may have noticed a number of satellite trucks adorned with banners that read “5G-supported Spring Festival Gala,” lined up outside the park, where rehearsals and preparations for the show have been in full swing. According to CCTV, the upgrade is thanks to a state-level 5G-based new media platform jointly launched by CCTV, Huawei, China Unicom and China Mobile on January 13, which has been undergoing test phases in the lead up to the gala. The 2019 Spring Festival Gala, which is said to be the most watched TV show in the world, is scheduled to be broadcast live starting at 8pm on February 4. The main stage for the show will be in Beijing, with three other off-site stages, including Jinggangshan in Jiangxi province, Changchun in Jilin province, as well as Shenzhen. The implementation of the 5G technology, together with magnificently-illuminated skyscrapers nearby, ties in with the theme of the performance for Shenzhen, intending to reflect the city’s increasingly large role as a hub of technological innovation in China. The show also aims to shine a light on the robust and rapid growth of the southern city, following four decades of Reform and Opening-up, according to Nanfang Daily. Much like the grand light fest, which was held in celebration of the 40th anniversary of Reform and Opening-up last September, the skyscrapers in Futian CBD, which surround Shenzhen Civic Center, will again be incorporated as a grand backdrop for the gala. 2,000 invited guests will attend for the show, but don’t fret if you’re not on the list because we have a guide for where you can tune in for the world’s most watched TV show. Qiqi lost her life after her distracted father left her in the car for over nine hours. The Kung Fu Komedy podcast is back. Andy hits his tenth Chinese New Year and reminisces on many wild new year celebrations. Happy Chinese New Year, from That's, thMart & Urban Family! From all of us here at That's, thMart and Urban Family, we hope you have a fantastic Spring Festival break. How did you spend the first day of 2019? If you tossed and turned last night, rest easy – the missing fourth grader has been found. Every parent's worst nightmare came true for Wang back in 1994, when his 3-year-old daughter disappeared from a fruit stall he ran in Chengdu​. One of the new exit-entry point's most hyped features is that it will provide direct-arrivals for both people and vehicles. Happy Chinese New Year, from That's & Urban Family! From all of us here at That's and Urban Family, we hope you have a fantastic Spring Festival break.